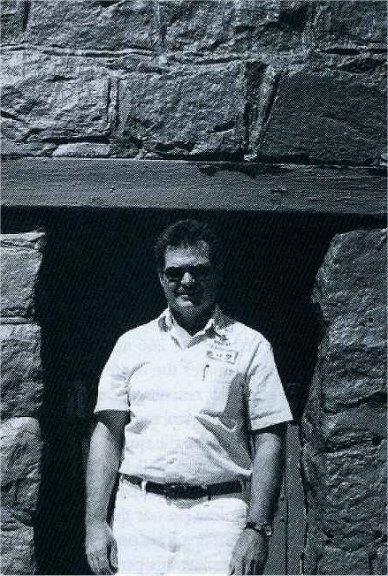 Burroughs Bibliophile Frank Puncer stands in the doorway of "Brown's Folly,"
the old Fort Grant Commissary building, the only remaining structure from ERB's days there. In September of 2002 I contacted the Arizona Department of Corrections to inquire about making a visit to Fort Grand state prison in Graham County. I explained that my interest was purely historical. My favourite author Edgar Rice Burroughs had served there as a member of the Seventh U.S. Cavalry back in 1896-97 when the place was still an active military post. Specifically, I wanted to know if any original 19th century structures still remained that I might examine and photograph. Jim Robideau, of the ADC media relations office in Phoenix, informed me by phone that one original fort building still remained essentially intact. It dated to the early 1880s and had served as the fort commissary during ERB's army days. Curiously, the structure possessed a rather strange nickname -- "Brown's Folly" -- which I would learn more about when I made my visit. First, however, I would have to undergo a background/security check -- standard procedure for anyone seeking access to the prison complex. This required that I furnish the ADC with my full legal name, date of birth and social security number. After passing this preliminary check I was further advised not to wear denim pants, chambray shirt, nor any orange clothing when I made my visit. (No problem, I would wear all white.) In addition, I would not be allowed to photograph any prisoner or any security device. Having agreed to all of the above, I was cleared to meet Warden Ernest J. Trujillo and his assistant Mr. Robert Patton at the Fort Grant Unit of the Arizona State Prison Complex Safford on Monday, September 30, 2002, at 11:00 A.M.
On the appointed day I left my home in Tucson about 8:30 A.M. bringing with me two 35mm cameras, one loaded with color film, the other with black and white. Heading east on 1-10, I traversed the picturesque San Pedro Valley and Texas Canyon, entering a rocky wonderland once claimed by the Chiricahua Apaches. The Southern Pacific Railroad Depot at Willcox is where ERB detrained in 1896 to get to Fort Grant. It has been renovated and placed on the National Register of Historic Places (see plaque). At Willcox, in Cochise County, I paused to photograph the recently renovated Southern Pacific Railroad Depot. 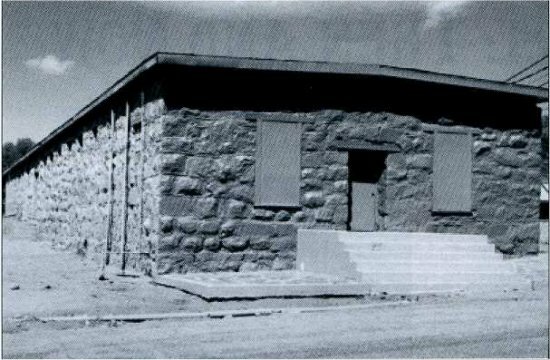 The two-story wood frame depot, first erected in 1880, appears as it did in 1914 and currently functions as Willcox city hall. As I stood before it, listening to the clatter of passing freight cars, it was easy conjure an image of young Ed Burroughs training at this very spot on May of 1896 -- his mind teeming with visions of a dashing military career. Warning sign approaching Fort Grant State Prison. The Pinaleno Mountains of Arizona are in the background. From Willcox there are two approaches to Fort Grant. Old Fort Grant Road zigzags north through the sparsely populated Sulphur Springs Valley, connecting with State Route 266 near Bonita. This road roughly approximates the route ERB travelled by stagecoach as a new recruit reporting for duty. Though shorter, the last ten miles of Fort Grant Road are unpaved. I chose the quicker, fully-paved route. This led me east from Willcox on 1-10, north on U.S. 191 toward Safford, then back west on State Route 266 through a low pass at the southern end of the Pinaleno Mountains. It is possible that ERB crossed the Pinalenos near this point. I arrived at Fort Grant apparently on schedule as Warden Trujillo pulled up right behind me on his motorcycle. I introduced myself as a Burroughs Bibliophile and we exchanged friendly greetings as he escorted m into his office. Soon we were discussing the details of ERB's Seventh Cavalry experiences. 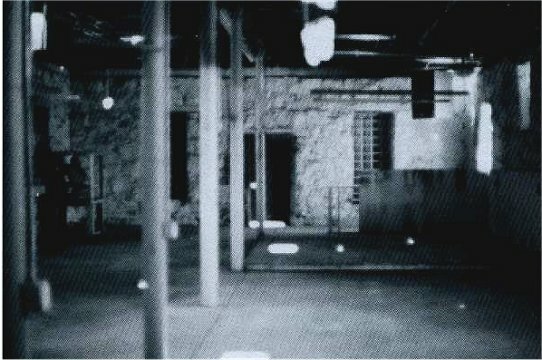 The warden inquired whether any photographs existed of Burroughs at Fort Grant. I had brought along some ERB material and I now presented Warden Trujillo with a copy photograph of Ed with his army pals taken at the fort in 1896. I also provided some photocopies of sketches ERB had made during his cavalry days. The warden thanked me and it was obvious that he took an interest in the subject. He indicated that the material I gave him would be on display. 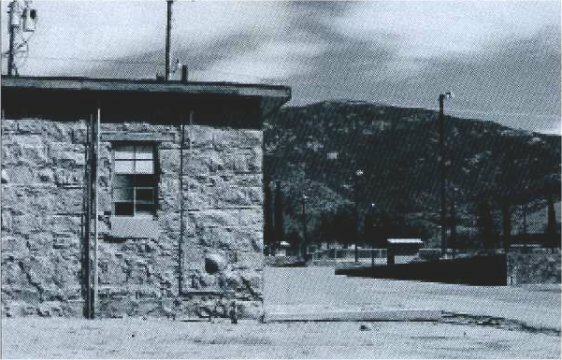 The old Commissary building ("Brown's Folly") at Fort Grant, Arizona. ERB shopped here during his cavalry days. It was built in 1880-1881 and is the only remaining structure of the original fort. It was now time for my much anticipated tour of the old Fort Grant commissary, or quartermaster's store, known as "Brown's Folly." Stepping outside, the warden and I were greeted by security officer Captain Bahn who escorted us directly to the prison entrance. After several passes through an extremely efficient metal detector, I was issued plastic I.D. tag. Moments later, I found myself on the grounds of a medium security state prison housing five hundred male inmates. As Warden Trujillo and Captain Bahn guided me between rows of low-lying buildings, we were passed by a pick-up carrying a work detail of prisoners dressed in orange prison garb. I was instantly reminded of the heavy manual labor that ERB and other enlisted men of the Seventh Cavalry were faced with daily under Colonel Edwin V. "Bull" Sumner -- labor that ERB ruefully referred to as "boulevard building." Some things haven't changed very much since Burroughs was here, I mused. The view from "Brown's Folly" looking northeast with Mount Graham in the background. Soon we were standing in front of "Brown's Folly." The structure is a formidable stone and mortar rectangle, very long, very solid, clearly quite old. The original roof has been replaced and concrete steps now stand where a wooden porch once was. Captain Bahn unlocked the front door and we entered. As I passed through the portal a hundred and six years melted away as I realized ERB must have done the same many times. This had been the soldier's store where ERB would have purchased all manner of personal items -- from clothing to pens, pencils, stamps and stationery. the only remaining structure from historic Fort Grant. The building is currently unused and empty, giving the interior a vaguely eerie , spectral quality. Or so I fancied. I slowly paced the length of it, gazing at the thick stone walls, taking photographs, glancing through the high-set windows at a bright Arizona sky. I could have spent many hours there absorbing the atmosphere, listening for the voices of long dead soldiers, the bustle of a frontier army post that was no more. . . But Warden Trujillo and Captain Bahn had other matters to attend to and they couldn't leave me alone. Reluctantly, I exited. Next, we circled the exterior which has been painted a pale blue to match the prison color scheme. I snapped a few more photos and tarried as long as I dared. I suggested to the warden that it would be nice if a historical marker could be placed at the spot to help ensure the future preservation of the building. He agreed that it was a good idea. Then it was time to go. In the parking area we were met by Assistant Warden Robert Patton, who is also the unofficial Fort Grant historian. The four of us gathered in Warden Trujillo's office where we discussed ERB's cavalry service and Fort Grant's past. The warden passed around the photos I'd given him and Mr. Patton briefed me on the background of "Brown's Folly." According to Mr. Patton, the old commissary was originally the camp armory. By the late 1880s it had been converted to function as the commissary. It was used in that capacity until the fort was abandoned in 1905. The only other original structure that had survived until modern times was the Fort Grant commanding officer's residence. Unfortunately, that historic building was destroyed by an arson fire during a 1987 prison riot. The blaze also destroyed many boxes of old Fort Grant and State Industrial School records that had been stored at the residence. the Fort Grant commanding officer's residence. The residence was destroyed by fire during a 1987 prison riot. But whence the appellation "Brown's Folly" for the commissary? According to Mr. Patton a certain Colonel Brown was entrusted with $30,000 for construction of the edifice back in 1880-81. The good colonel managed to get the job done for $10,000, keeping the balance for himself. He was later court-martialed for his misdeed. The former commissary's nickname bears testimony to his downfall. My brief visit was now over. As we filed back outside to the parking lot, I glanced up at Mount Graham looming just beyond the prison complex. I had one last question. What route would a cavalry troop have taken over the mountain in 1896 to get to the community of Solomonsville (now Solomon) east of Safford. Mr. Patton pointed out an old army wagon road that began at the rear of the fort and led up the side of Mount Graham to Grant Falls and Jesus Tanks, on Goudy Creek, and on to Jesus Pass. He surmised that this may have been the route followed by ERB's B Troop. The terrain certainly matched Ed's description of a harrowing climb directly over the Pinaleno range. Burroughs' hunt for Apache renegades with Troop B, Seventh Cavalry is notable for two reasons. First, it is remarkable that ERB went along for the ride at all. Suffering from dysentery and its attendant discomforts, he was literally falling out of his saddle as he struggled to keep up with his troop. In his weakened condition he probably should have remained at the fort. The Apache Kid's native name was "Hashkee Binaa Nteel,"
meaning "Angry, he has wide eyes." He was hunted by ERB's cavalry troop in 1896. Secondly, the fact that ERB's troop was searching for a legendary outlaw, Apache Kid, ties Burroughs' name -- however loosely -- to the Apache Kid saga. The Kid was a hot item in 1896. With a $5,000 price on his head he was wanted for alleged depredations on both sides of the border. 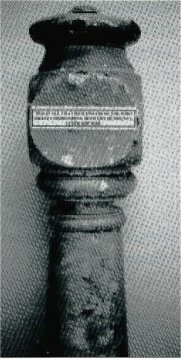 On June 4, just two weeks after Burroughs arrived at Fort Grant, the United States and Mexico signed a reciprocal crossing agreement that was specifically designed to defeat Kid and his band. A day earlier Colonel Sumner had reported from Grant that Apache Kid was just across the border. Had ERB's troop run afoul of Apache Kid's band it would have possessed authority to continue pursuit into Mexico. But Fate was not that kind to Edgar Rice Burroughs. Kid's life was fascinating and deserves a brief explication in light of recent research. Born about 1860, Kid was a member of the Aravaipa Apache band. HIs Apache name is believed to have been Hashkee Binaa Nteel, meaning "Angry, he has wide eyes." Kid served as a loyal first sergeant of Apache scouts for the U.S. Army in the 1880s, participating in major campaigns during the Geronimo wars. He was a close friend and associate of Al Sieber, the army's venerable chief of scouts. In May 1887 Sieber left his favorite scout, Apache Kid, in charge of the scouts and guardhouse at San Carlos Reservation for several days. During Sieber's absence Kid shot and killed an Indian named "Rip," whom Kid believed had instigated the murder of his father. 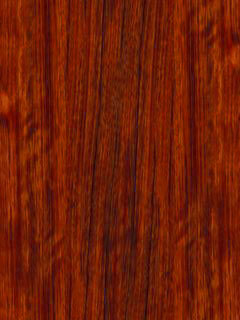 Apache custom dictated that Kid take this blood vengeance. On Sieber's return more trouble ensued. A crowd gathered as Kid rode in and dismounted in front of Sieber's tent. Tension was high and a general melee erupted. Al Sieber was struck in the ankle by a .45-70 slug, a wound that crippled him for life. Though Kid had not fired a shot he was court-martialed for mutiny and imprisoned on Alcatraz Island. Sixteen months later his sentence was remitted by Secretary of War William C. Endicott. Kid returned to San Carlos, a free man. The local white citizenry, however, did not want Kid around. In 1889 Kid was arrested by civil authorities and put on trial at Globe for "assault with intent to commit murder upon one Albert Sieber." The charge was false. But Kid was convicted and sentenced to seven years at Yuma Territorial Prison. 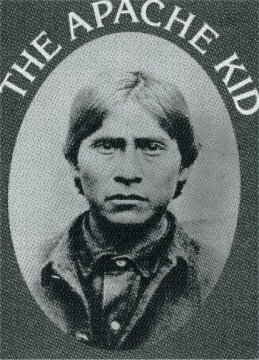 On November 2, 1889, Kid was one of eight Apache prisoners who escaped from the stage carrying them to Yuma Prison. The Apaches killed Sheriff Glenn Reynolds and his deputy, and seriously wounded the stage driver. This incident, known as the Kelvin Grade Massacre, marked the genesis of Kid's true outlaw career. Kid sought refuge in the vast Sierra Madre Mountains of Mexico where he hid out for many years. It is possible that he joined one of the small remnant groups of "lost Apaches" who refused to give up the old life-way. Shootouts with these Apaches occurred in Mexico as late as the 1920s and '30s. Kid was blamed for many murders and depredations but it is impossible to determine which crimes he may have actually committed. Nor does anyone know for certain when or how he died. That is part of the enigma of Kid. Though several men claimed to have killed him, none ever collected the reward. Some modern historians believe that Kid lived well into the 20th century. I like to think that he did. Burroughs and B Troop never caught up with Apache Kid. "Angry, he has wide eyes" was too well versed in military ways to allow the army to ever take him. But ERB's hellish journey over the Pinaleno Mountains was not made entirely in vain. If nothing else, ERB proved to himself that he could conquer his physical pain when duty called. Assuming that he did not exaggerate his ordeal, the first day or two on the trail must have seemed to ERB like some terrible rite of passage. He could have remained behind, thus avoiding the experience altogether. But, had he done so, he would have regretted it for the rest of his life. Perhaps that is the main reason he chose to go along because the alternative would have been unthinkable. Fort Grant remains almost as isolated today as it was when ERB and his troop searched unsuccessfully for Apache Kid. 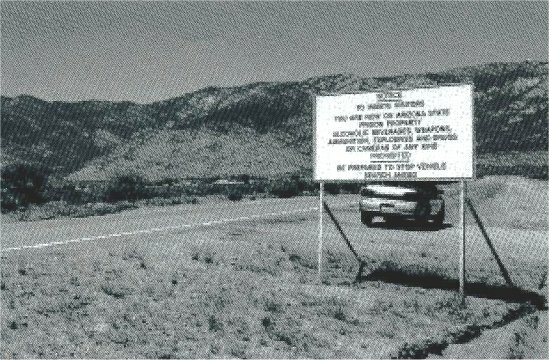 The mountain range that ERB crossed is now home to Mount Graham International Observatory. Astronomers from aouirnd the world come there to do research, using an array of recently constructed telescopes. The range is home to Arizona's biggest population of black bears and an endangered species of red squirrel. Some of the state's oldest living trees are found on its eastern slopes. Members of the nearby San Carlos Apache Tribe regard the high peaks as the sacred abode of the Mountain Spirits. They call the place "Dzil Nchaa Si An," meaning simply "large mountain." It was, perhaps, the largest mountain in Edgar Rice Burroughs' life. Fort Grant, in Graham County, Arizona, is now part of the state's Department of Corrections. Security Officer Captain Bahn. All were cordial and helpful to visiting historian Puncer. Alexander, David V. Arizona Frontier Military Place Names 1846-1912. Las Cruces, NM: Yucca Tree Press, 1998.
de la Garza, Phyllis. The Apache Kid. Tucson: Westermlore Press, 1995. Hatfield, Shelley Bowen. Chasing Shadows, Apaches and Yaquis Along the United States - Mexico Border 1876-1911. Albuquerque: University of New Mexico Press, 1998. Hunton, Robert L. "On the Trail of Edgar Rice Burroughs: Hiking Arizona's Eastern Ranges." Burroughs Bulletin New Series, Number 40. Porges, Irwin. Edgar Rice Burroughs: The Man Who Created Tarzan. Provo, UT: Brigham Young University Press, 1975. Sanchez, Lynda A. "The Search for Apache Kid's Daughter." True West Magazine, January and February, 1999. 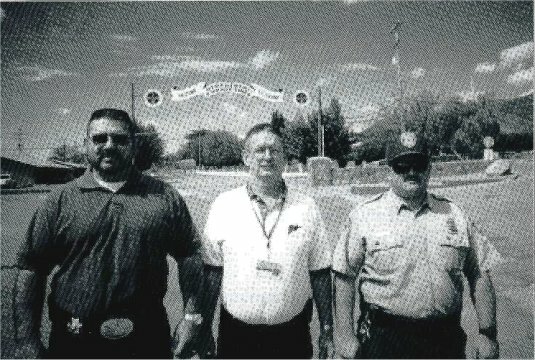 Author's personal conversations with Warden Ernest J. Trujillo and Assistant Warden Robert Patton at Fort Grant Unit, Arizona State Prison Complex - Safford, September 30, 2002. Note: Visitors are welcome in the lobby of the administration building, but to get into the prison grounds to view "Brown's Folly" would require advance arrangements with the Arizona Department of Corrections.